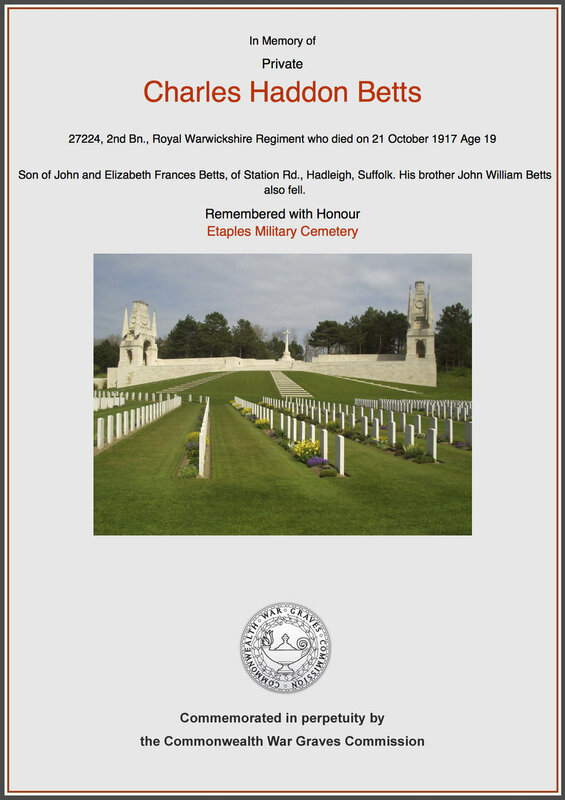 Relatives: Son of John and Elizabeth Francis Betts and brother of John William Betts who also fell. 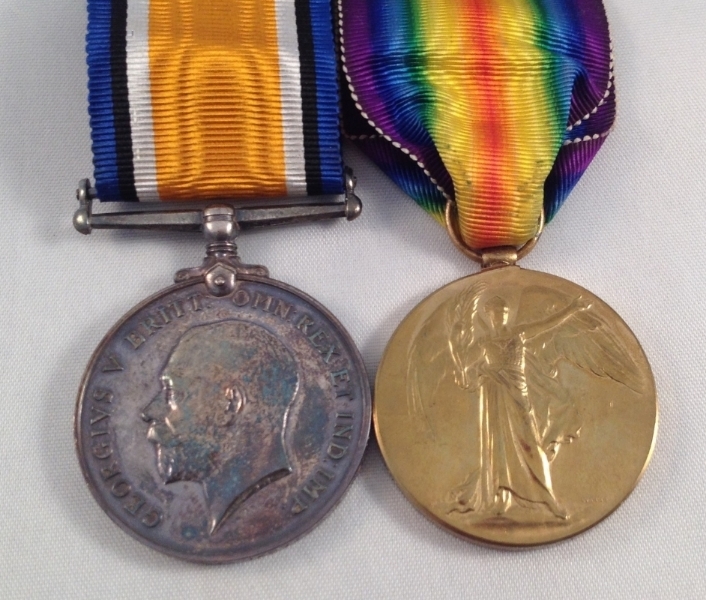 The whereabouts of Charles' medals is unknown, but he would have been entitled to the British War Medal and the Victory Medal. 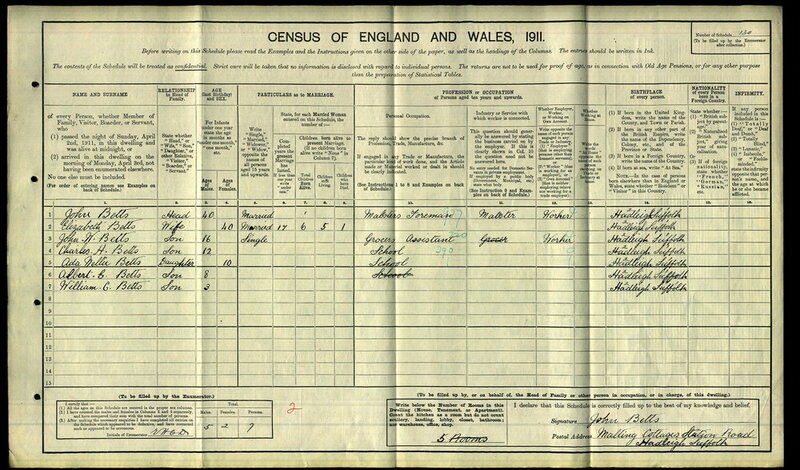 The 1911 Census shows Charles aged 12 living at home with his parents John and Elizabeth and siblings; John W (16), Ada Nellie (10), Albert B (8) and William C (3). The family were living in the Malting Cottages on Station Road. "The 2nd Royal Warwickshire, who on October 4 had been in reserve at Zillebeke Lake, attacked at dawn on October 9 from a position east of Polygon Wood, having for its first objective Judge Copse near Reutel. On the left "D" Company carried Judge Copse, whilst on the right "C" Company reached a line north of the Cemetery. Nevertheless the position was difficult and confused; and the casualties were heavy. In "C" Company Captain C. L. N. Roberts had been killed ; by noon Captain D. Aucutt and all the officers in " D " were killed or wounded, and the company was commanded by Sergeant Partridge. The other companies were sent forward, and in the course of the afternoon the parties of the enemy who remained in the Copse and Cemetery were disposed of and connection established on either flank. 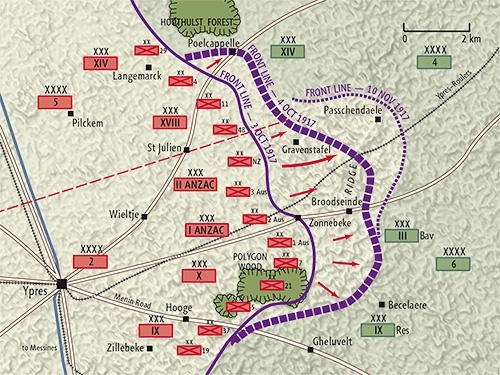 The whole attack had resulted in the capture of the German position at Reutel. The 2nd Royal Warwickshire was relieved at night; their casualties were 6 officers killed (including Captain Blandy of "A " Company) and 5 wounded, of other ranks 54 were killed and 258 wounded or missing." It was during this action that Charles was wounded. He was evacuated to one of the British Base Hospitals at Etaples on the French coast. 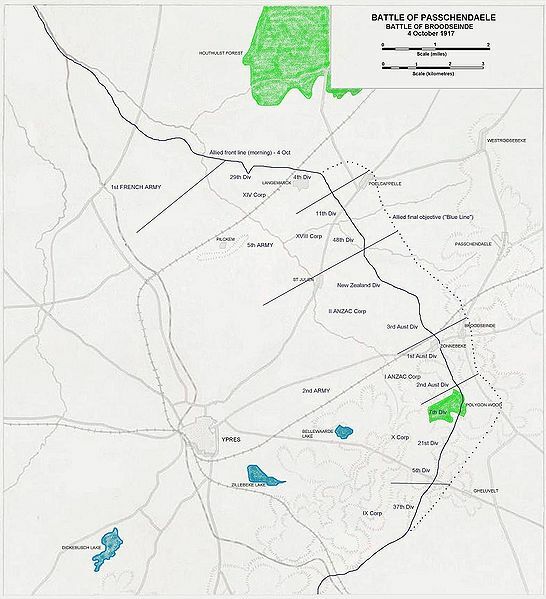 This was a large concentration area and a major location for troops arriving in France and more importantly, for casualties being transported back home. The Suffolk & Essex Free Press of 24th October reported that Mr and Mrs Betts had received a letter from the Chaplain that their son had been wounded and it stated that he was progressing as well as could be expected, he sent his love and promised to write. In the evening of the same day, they received a telegram from the War Office to say he had died. In the same article, Charles' old headmaster, paid tribute to him. — Mr Harriss, Headmaster, Bridge Street School. This was the first of a double tragedy for the Betts family. Charles' older brother John William served with the Suffolks from the outbreak of the war and was wounded at Kemmel in April 1916. He spent 6 months in hospitals before being medically discharged in late 1916. 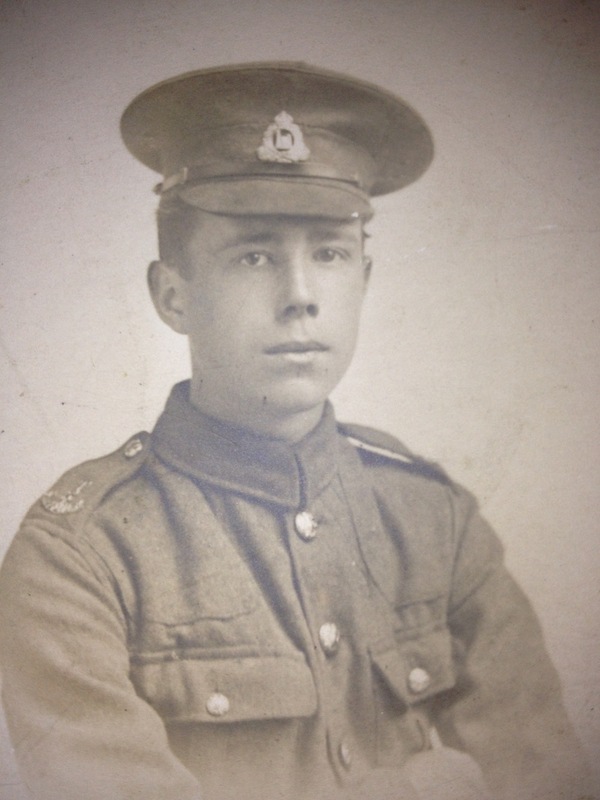 John continued to suffer the effects of the war and died at home in Hadleigh in November 1918. 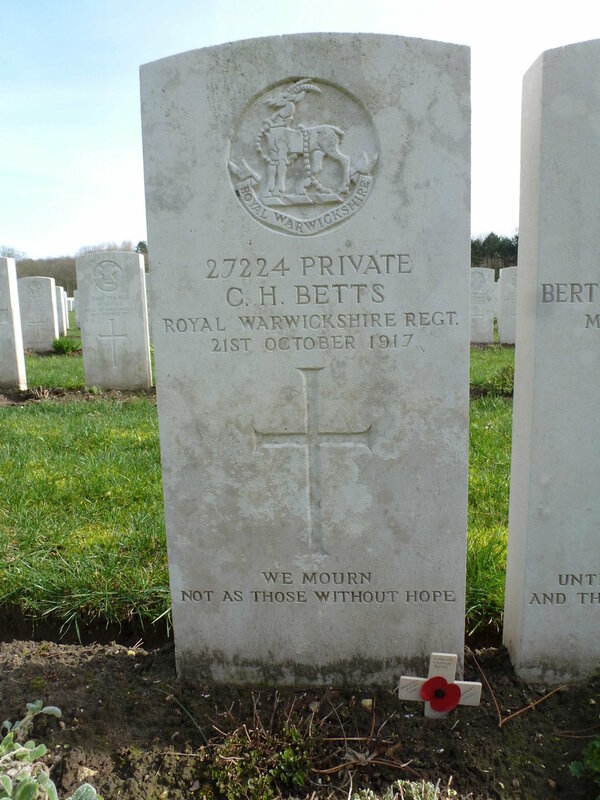 Charles was buried at Etaples Military Cemetery and is remembered on the Hadleigh War Memorial and on his brother's grave in Hadleigh Cemetery. 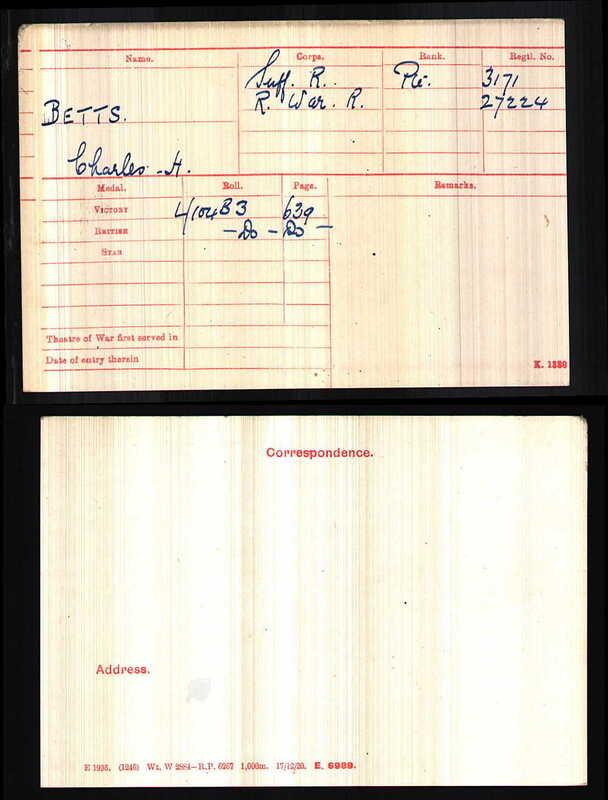 We hope that this page has been able to tell the story of Charles Haddon Betts. If you know of any information which might help to add to the story then please get in touch.